Private funeral Services were held for Adele J. 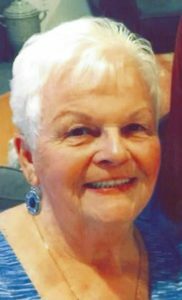 (Robinson) Mazzone, of Saugus, formerly of Revere & Marblehead, who died on Tuesday, February 5th at the Kaplan Family Hospice House, due to a lengthy & confining illness. Born in Lynn, she was raised & educated in Marblehead & was an alumna of the Class of 1962 of Marblehead High School. All of her working career was spent as an expert hair-stylist & colorist in several of the North Shore Salons. The family lived in Revere for about twenty years, before moving to Saugus two years ago. She is the beloved & adored wife of Paul A. Mazzone for the past 46 years. Paul is a retiree of the Revere Public Works Department. She is the cherished mother to Robyn D’Apolito & her husband, Stephen of North Reading, Michael T. Bozek of San Antonio, TX, John B. Bozek & his wife, Sherry of Tewksbury, Nicole M. MacTaggart & her husband, Kevin of Saugus & the late, Paul A. Mazzone, Jr. She is also lovingly survived by her daughter-in-law, Deanna Mazzone of Dracut, 14 (fourteen) grandchildren & 2 great-grandchildren. She was the devoted daughter of the late Byron Robinson & Ruth (O’Dell) Robinson & the dear sister of the late Judy Lang & John Robinson. Interment was private. Remembrances may be made to the Kaplan Family Hospice House, 78 Liberty St., Danvers, MA 01923. Paul&Family- Please accept my sincere condolences on your profound loss. John Henry, Boca Raton,Fl.